This is a competition entry at Terragenesis. 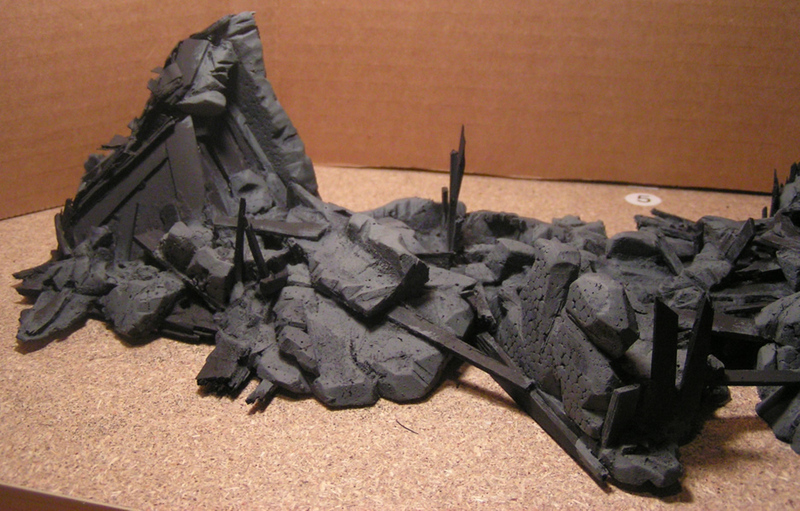 While browsing the internet for Miniature War Gaming sites, I’ve come upon this one many times. Here’s the link to the very useful Miniature WarGaming Site. I’m getting very close to completing my Mordheim tower. 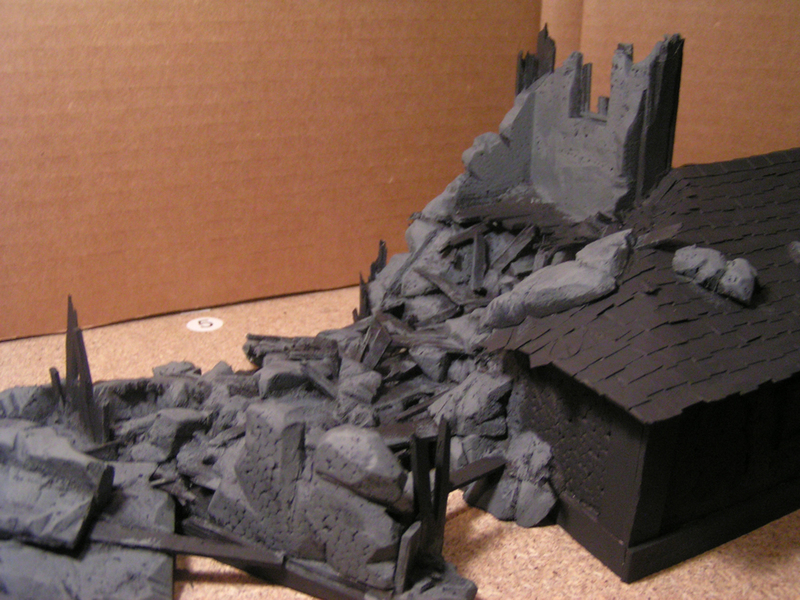 All I have left is some final details for my collapsed tower, and I thought I’d give you a little sneak peak of the color I chose to use on the walls and what the wood in the rubble looks like. You can see an arrow that is sticking out of the side of the building in the shadows (top right) as well. 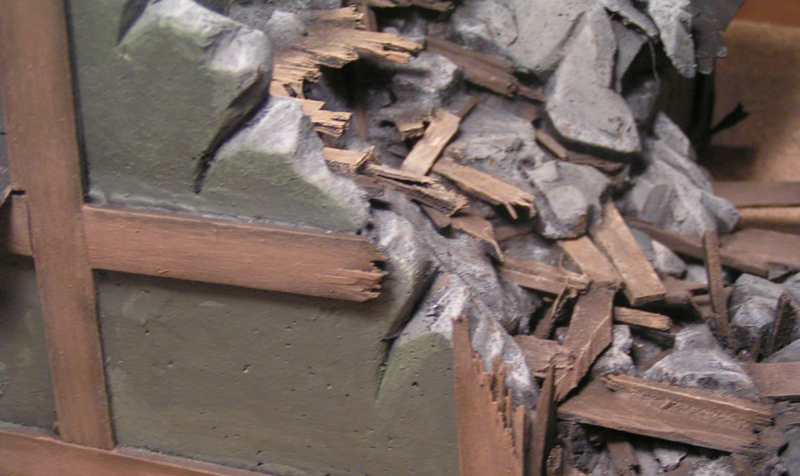 In this picture you can see the two different “kinds” of wood in the rubble. The floors of the tower were made with a nice light pine wood, while the wood on the outside of the building was mostly aged/weathered oak (the darker color). I’m going to be repainting these models this year =). Although Cement is normally thought of as a “dull” material, sunlight gives just about everything highlights. 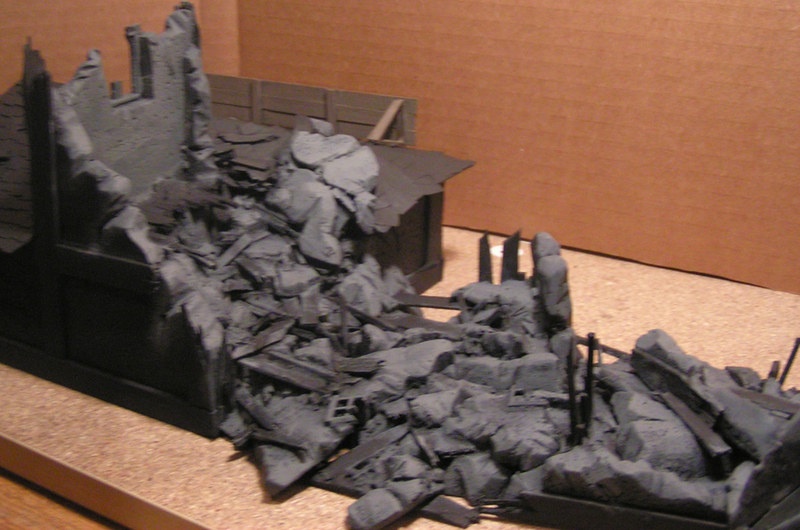 After I gave my pile of rubbles a good think brushing of Dark Gray, I drybrushed it with subsequent coats of lighter and lighter gray. Each times the color got lighter, I used less paint and didn’t press as hard with my brush. This gave the impression of highlights on the edges of the cement. I’ve narrowed my pile of rubble down into three main colors. Before this Mordheim tower was destroyed, it stood four stories tall, and was made of gray cement. 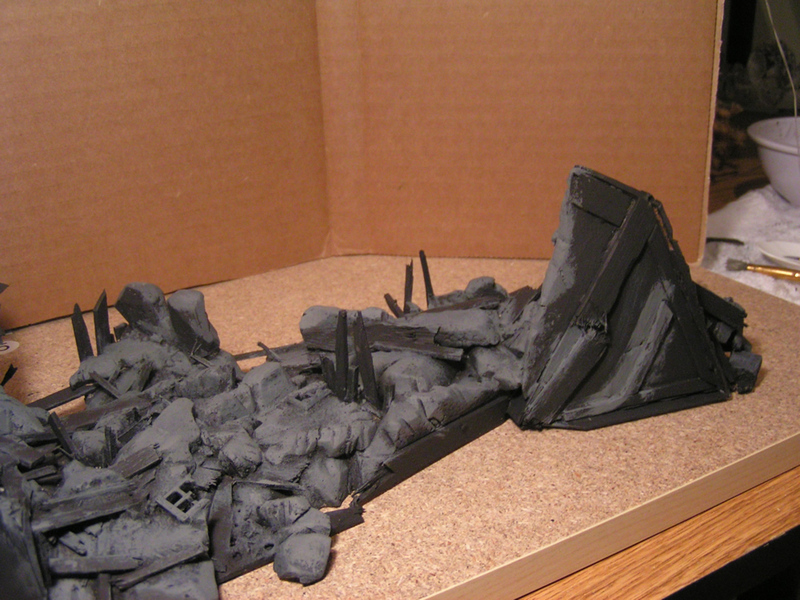 This gray color is definitely going to be the most prominent color in my pile of rubble. The next most prominent material in my Voltaire’s Magic Shop is wood. Each floor and all of the stair cases were made of wood and although many of the loose pieces of weed have been hauled off by travelers to build ladders, mend fences and make shields, there is still a good portion of wood sticking out from the rubble. There are two main types of wood here. The first is the weathered, darker wood from the framing on the outside of the building. The second is the lighter wood from the interior of the tower. This wood didn’t have to endure the years of harsh weather before being knocked over by a comet. The last color is the color on the outside of the tower/building. This color will only be on a few sections of the cement. I still haven’t made a final decision on what color I’m going to paint this building, so this color is up in the air. I will need to finish up this tower by the end of February, so look for a good number of posts from me on this project in the near future. 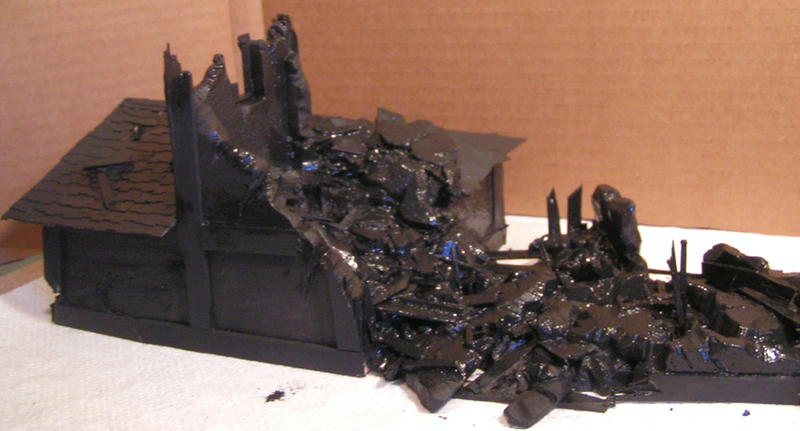 And here is a picture of it now that it has dried. 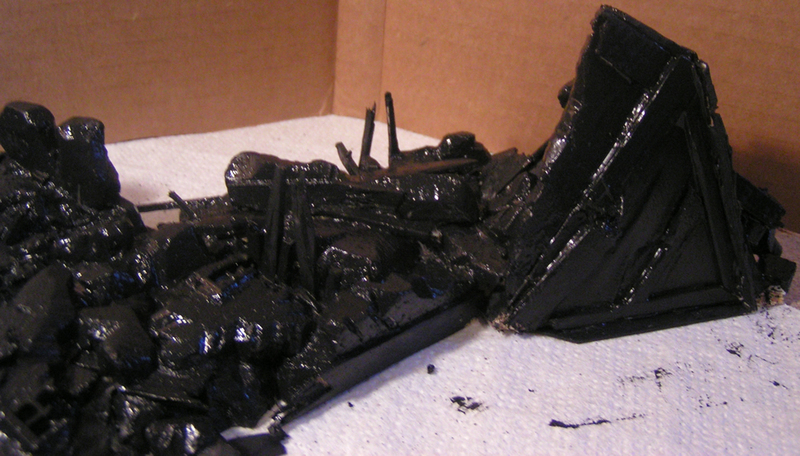 (I’ve also spent about an hour doing touch ups and getting black paint deep into the crevices. 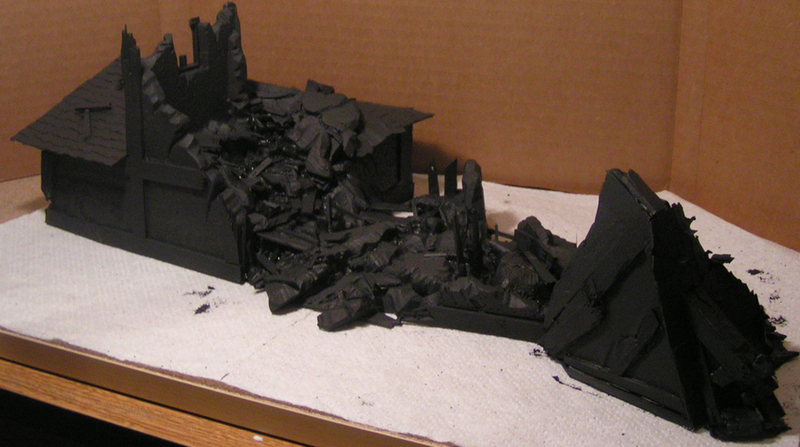 For this Mordheim building, I am planning on letting a lot of the black paint show through on the final product, so I definitely had to make sure every millimeter of this piece of terrain was base painted. Many people don’t know that before Voltaire became famous as an author, he owned a very profitable chain of Magic Shops in Mordheim. Until, of course, the comet killed all within the city. Fortunately for Voltaire (and literature), he was spending the new year with his family in a neighboring village when Mordheim was destroyed. This tower used to be Voltaire’s research tower where he developed many of his magic potions. This is also where he gained his first love of writing.